Yes we know. It has been blooming ages since our last post. We've no idea, of course, how many people out there rely on our updatification as their only source of joy in an otherwise dark and disturbing reality. But for those of you that fit that description, our apologies. 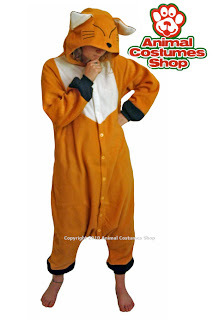 Well it was a hectic halloween, and apprently you lot's favourite kigurumi was... drum roll... more drum roll... slightly awkward drumroll duration........the fox! Not very scary, in fact one our cutest animal costumes, but there you go. Christmas is looking like it is going to be equally animal costume crazy and we are already running low on some of the favourites. So if you are thinking about purchasing something from our shop for a loved one, please try to do so as soon as you can to avoid disappointment. Particularly scarce, are the Kangaroo, Seal and Lion. Don't say we didn't warn you. You might also have noticed that we've really ramped things up a notch in our range of animal hats. The British winter has been quite pleasant so far but the new range is proving very popular so far.